yoyos | Flickr - Photo Sharing! carriesommer, fiberjinx, Julie Alvarez, and 1 other people added this photo to their favorites. i know i know...but i can't help thinking of project runway!! hehe. these look so pretty all together! wondering what they are for? Ha! Steve won't stop calling me ANDREA every time I make one of these things!! do i see a garland in the making? how'd you figure that out, Hannah??? You're tricky, very tricky! i love yo-yos. i am so stealing your idea! Those look so pretty like that. Just. like. that. I had a dream last night that I went into the thrift store looking for vintage thread, and the ladies were looking at me like I was crazy. 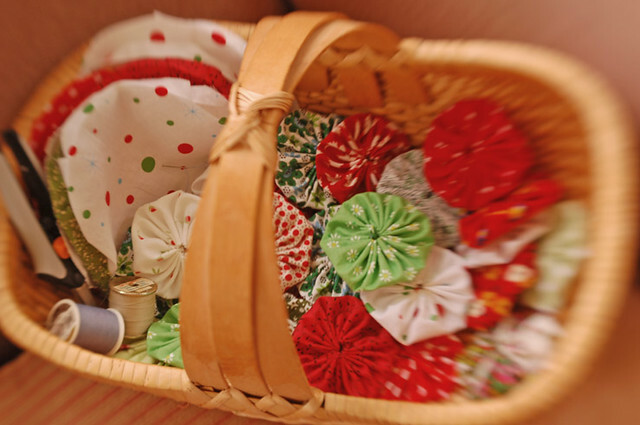 Then I found a "kit" for making yoyos in holiday-appropriate fabrics on the bottom shelf behind some other junk. Looks like I have SouleMama on the brain! Good idea... I have about two thousand of those sitting in a box in my studio!